Plug in - push button - unplug - GO. Reprogram Suzuki fuel injection rates with no add-on boxes to the bike. Richens OR leans out mixture. Tune your or your customers' Suzuki's like the AMA pro's! Make the changes - then take the tool off - Not an add-on box! When at the track, it's difficult to fiddle around with laptops on the pit wall - saving files, loading files, uploading, waiting, downloading, renaming, overwriting (oops! ), losing downloaded maps, laptop batteries dying, tripping over serial cables.... cracked LCD screens.... Ick. 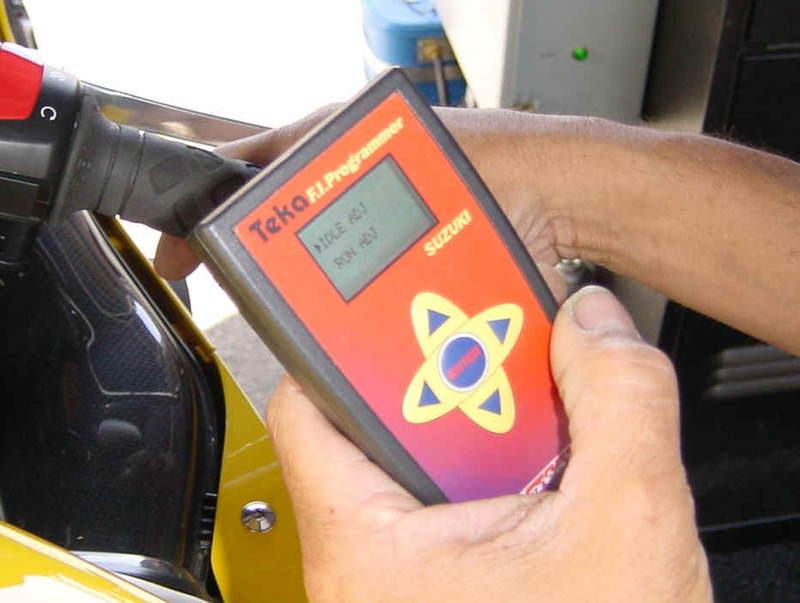 Factory Pro's new Teka SFI will, simply, allow you to make fuel changes on your Suzuki in less than 20 seconds. No laptop. No palm pilot. No hassle. Realtime changes - even AS the bike is RUNNING. Multiple Pro Racing Podium finishes - Mike Smith, Jimmy Moore, Tony Meiring, Team Hooters, EDR Racing and many more. Before the Teka SFI came along for the Suzuki, the only realistic choices available to tune the Suzuki were either the venerable Yoshimura "421" 3 position, +/-"10" analog reprogramming box or a power commander. The other tuning scheme possibility was to buy a pc and subscribe to the dream that you could download the perfect map off the internet for your bike and pipe and experience magical perfection in performance. Wow. Cool.... So - now that pretty much everybody in the industry knows that is a sales marketer's dream (selling the sizzle, as they say...) - we pretty much know that if a downloaded map happens to work perfectly on the bike that you are working on, it's good luck. A Las Vegas gamble, as they say. So - since the ~$300 - $400 power commander purchase gamble may or may not work really well, depending on how lucky one is, it leaves the pc owner open to only 3 options - ride the bike as is and complain about it (most common), download more maps and keep trying to find a map that works (maybe 5% to 10% of owners) or give up and pay someone else $200 - $500 to make a custom map for his or her bike. For the customer, the Teka SFI provides the means to properly tune, to a fine degree, the original Suzuki Fuel Injection system. The cost per bike? Only the labor time invested. The Teka SFI has the range of about the equivalent of "4-5 main jets" (it's actually more because the Suzuki ECU accommodates some changes automatically). SFI changes FI mapping when you press the button - so you can hear the idle change while the engine is running - better or worse? As far as that goes - the idle quality (for some reason) will always be better with the SFI over a Suzuki with a pc installed. Starting, too, is better with the TEKA SFI tuned bike over a pc3r equipped bike. It's pretty nice when you take off a pc3 and use the SFI to tune the bike - the customer touches the starter button and the bike doesn't grind and maybe backfire before it starts - the drama is gone and the customer is happy...... "Starts just like it did when it was stock! - Thank you!" All done? Take the SFI off and take off! And - no. The ECU will NOT lose the map if the battery power is disconnected. Whoever says that doesn't have enough experience to state that (obviously true, because they are wrong). And no, a power commander will still work just fine if the stock Suzuki ECU is not zeroed out. (it's painful to listen to a poor customer who has decided that they are going to try a pc after Teka SFI and the guy who "sold them on the pc" and tells them that the pc "won't work" if the ecu isn't zero. It's not uncommon to see a Suzuki race team with a semi-tuned Suzuki ecu, with a pc added (because they don't have the ability to tune the kit ecu and their dynojet dyno can "tune to an af ratio") fine adjusting the fueling with a Teka SFI to make the "tuned to an af ratio" pc mapping work on the track....... for example. What if there is something really odd in the fuel curve of a highly modified bike and the Teka SFI can't adjust the ECU enough? No big matter - you only have some labor invested and you don't have to deal with a parts return or a disgruntled customer. You tried and it couldn't be done - they must buy an aftermarket "add-on" box and deal with that cost. Better to start with the cost effective SFI method - rather than selling everybody add-on boxes that still need additional tuning anyway. 1. EC997 Low Inertia Dynos (EC997's natively tune to best power settings - not so-called "A/F Ratio") - quick and easy and most accurate with best customer satisfaction. 2. 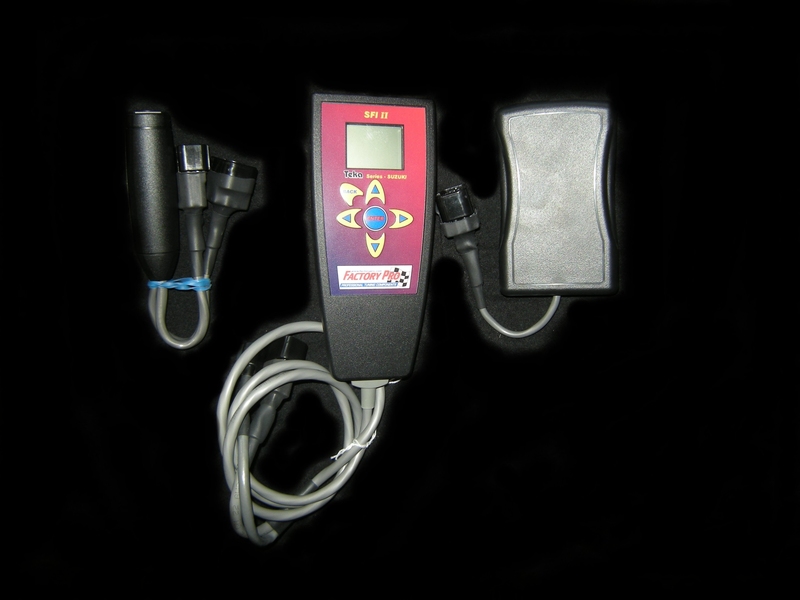 Dynojet 100, 150, 200 and 250: For best customer satisfaction, don't make the product look bad - please tune for best power - not a/f ratio! - use 6th gear to tune. Do not use 4th gear except on small bikes. Unlike other Suzuki add-on boxes (like pc's and Teka EMS's) requirements, the TEKA SFI is PERFECT for FI tuning on simple inertia dynos, like the dj 100, 150 and 200. Remember - the same people who brought you jet kits that work and FI tuning products (finally!) that are cost effective - designed and built the first, and still the only easy to use AND reliable eddy current motorcycle chassis dyne! Imagine! The eddy current brake doesn't overheat and shut off like the others! Rocket Science?? Nah... Normal, good design concepts. 3. Fuchs: Same as dj dyno - tune for best power, use 6th gear to tune, all the time - The Fuchs has very little inertial mass - even less / worse than dj dynos. 4. Track or Road testing - Follow enclosed instructions and you'll be able to provide better drivability, customer satisfaction and power quicker than any autolinked anything! I just wanted to say thanks for the Teka box for my Suzuki is killer. Set up per instructions and have smooth stable power to 13000. pcIII good bye ,no more - kind of good. Also want to apologize for cutting u off when my parts came but when the cat comes back the rat must work. Absolutely NO carb parts sold in California. Finally - Quick, easy, cost effective Suzuki tuning with no expensive "add-on boxes"
Flight Training - train with AMA race winner Todd Harrington. The Harringtons own American Flyers, one of the most established flight training facilities in the USA. The Rich Oliver Mystery School will help you discover your hidden inner strength. It will challenge you. It will teach you a new way of thinking, and a new way of riding. You can take your riding to an exciting new level! We use a variety of proven drills and training techniques. Practicing these techniques with our Yamaha dirt track trainers will enhance your abilities both on the track or the street. It doesn't matter what you ride or race, the Rich Oliver Mystery School improves everyone's skill level and mindset! Book a sightseeing flight over the Wine Country or a Kamikaze aerobatic flight or a biplane flight over famous Sonoma Raceway, the Golden Gate Bridge and the San Francisco Bay for one or two during the spring and get a free souvenir t shirt! Just tell them that you saw this on the Factory Pro website! Northern California's most unforgettable flying experience. No experience required. Open weekends! The extension of the laboratory for engines of the Swiss Federal Institute of Technology was completed in about 1935. Its architect was Rudolf Otto Salvisberg (1882-1940). He had a successful career in Berlin but returned to Switzerland after the advent of the Nazis. His architectural style was somewhat similar to that of Erich Mendelsohn. The staircase of the laboratory is in normal use but well preserved. Edited to the tunes of Chemical Residue by Herbie Hancock.